A program for people with disabilities in the event of a disaster. Preparing Together is a volunteer-driven program developed by The Salvation Army Emergency Disaster Services to assist senior citizens and people with disabilities in the event of a disaster. The Preparing Together Planning Tool is just such a plan that addresses many of the challenges that put people at risk during a disaster. Preparing Together (PT) is a volunteer-driven initiative designed to assist senior citizens and people with disabilities in developing a personalized disaster preparedness plan. Studies have shown that seniors and people with disabilities are two segments of the population at great risk during disasters. How do I get involved in Preparing Together? 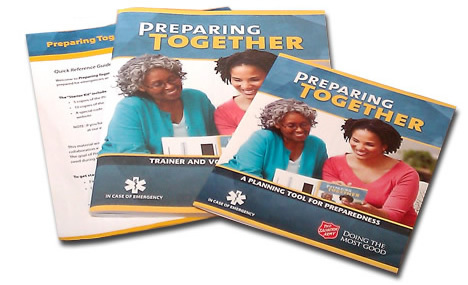 The Preparing Together program is usually established within a community circle, like a church, a community group or possibly within the local emergency management agency. Volunteers from these groups decide to support seniors and people with functional and access needs during times of disaster, and train to do so using the Preparing Together materials. However, you may want to do Preparing Together on your own, because you know someone who might need you to come alongside them to be prepared for a disaster. The Preparing Together program includes a training component, where volunteers learn how to help prepare someone who may need assistance. Who would benefit from the Preparing Together program? Any individual requiring some level of assistance during a disaster, either during evacuation or when sheltering in place, would benefit from this program. Preparing Together focuses on matching volunteers with people, who would be most at-risk during a disaster, those with physical and cognitive challenges. Using the Preparing Together Planning Tool, each volunteer works directly with a program participant to complete a preparedness plan and then stays in touch with the participant throughout the year. Agencies and groups such as places of worship, service clubs, community groups, and others concerned about their neighborhood would identify those individuals within their circle of influence and encourage them to be a part of the program. That individual would be paired with a volunteer who would serve as a preparedness coach, family contact, advocate for evacuation, and a guide for sheltering in place. Is the Preparing Together material available in Spanish? Yes. Most of the Preparing Together materials are available in Spanish. The new training video will be translated soon. Is the Preparing Together Planning Tool available in a format for visually impaired participants? Yes. 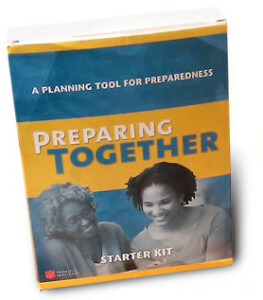 The Preparing Together Planning Tool is available in Braille, large print and text only format. An order form is available on the order page. Where can I purchase the Preparing Together Planning Tool? The cost to implement Preparing Together is $1 per person, plus shipping costs. All of the other materials are downloadable and completely free to anyone visiting this website. We want to make the program available to churches, community service groups or emergency managers looking to assist those who need this material.